Wood table legs take a constant beating from chairs and shoes. 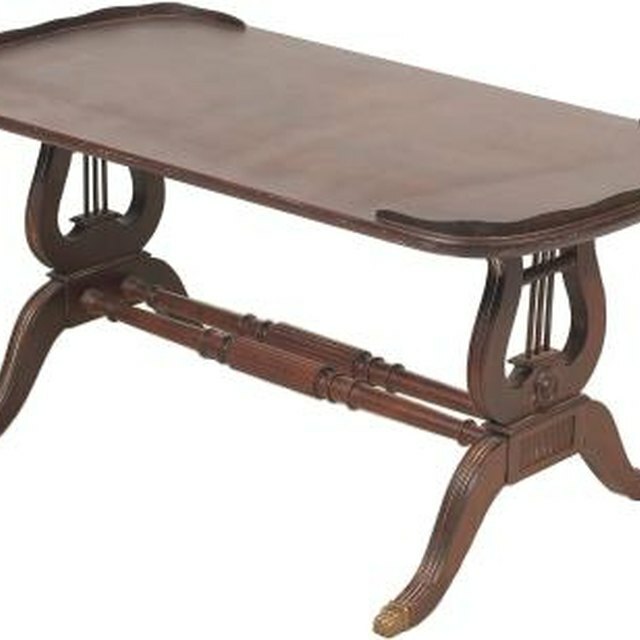 For a dining or occasional table, a time arrives when the table legs are so worn that the table either has to be replaced or the legs must be refurbished. Stain wood table legs to spruce up your current table or stain the legs on an unfinished table for the first time. For a professional finish, first remove old paint and varnish or stain before renewing the table legs with fresh stain. Stain each table leg individually for best results. Remove legs from table. Most legs screw beneath table corners. Use an Allen wrench or the screwdriver. Screw a leg into a vise clamp by placing the top (where the leg meets the table) into the clamp horizontally with a minimal amount of the leg’s top in the clamp. Use a furniture stripping brick to rub the surface of the leg back and forth until the paint, varnish and / or stain is removed. Furniture stripping bricks are sold under various brands and require no liquid chemicals. Rub lightly as the bricks are harsh and can nick or scratch wood. Buy furniture stripping bricks at hardware and home improvement stores. Sand the leg with a fine-grit sandpaper until the leg is smooth. Use a towel or rag to wipe away the excess dust and grit. Open the stain can by sliding a flathead screwdriver head under the rim and prying upward. Move the screwdriver around the lid, prying it open. Dip the paintbrush/sponge brush into the stain, wiping the excess stain against the top rim of the can. Paint the leg with the stain, starting at the top of the leg, painting in the direction of the wood grain, toward the leg’s end. Wipe the excess stain from the brush to avoid drips. Stain the entire leg, covering as much of the leg within the clamp as possible. Allow the stain to dry, about 4 hours. Remove the leg from the clamp. Turn the leg so the unstained portion formerly held in the clamp is visible. Cut a small strip of rag and wrap it around the stained portion of the top of the leg you just stained. Put the leg in the clamp. Stain the unstained portion of the leg top. Allow stain to dry. Spray the leg by holding the clear spray polyurethane nozzle at least 12 inches from the leg to minimize drips. Allow the polyurethane to dry. Remove the leg from the vise. Rotate the leg so the unvarnished portion of the leg top is visible. Wrap a strip of rag over the finished portion to protect the varnish / stain and resecure the leg in the vise. Spray the unvarnished leg top. Allow the polyurethane to dry completely, about 24 hours, before reattaching the table legs. Repeat all steps for multiple table legs.